The Historic Faubourg Tremé community of New Orleans is leading the community strategic planning process through the efforts of their neighborhood association. With the help of WhoData.org, a public participation geographic information systems (PPGIS) project that was implemented in 2009, residents and volunteers from Project Homecoming are gathering the necessary parcel-level data to support new visions to recapture, maintain, and plan for change. The on-the-ground surveys use the WhoData PPGIS models for surveying commercial development activity, property conditions and other quality of life issues. As a neighborhood still in the midst of recovery after Hurricane Katrina in 2005, community leaders and municipal planners have differed on how best to address issues of equity, job disparity, affordable housing, blight remediation and a looming threat of gentrification. Located adjacent to the historic French Quarter this community struggles to maintain aspects historic integrity in the midst of city wide revitalization. During the spring of 2013 the resident-led team collected survey data that WhoData will integrate with public data including Louisiana Land Trust, Lot Next Door, Blight and Assessing data to evaluate areas for neighborhood stabilization and problem eradication. This research also aims to draw on earlier WhoData lead on the ground surveys from 2008, 2011, and 2012. Using these data sets geographic information system tools will be utilized to analyze land use change over time. Recovery plans in the Historic Faubourg Tremé community have emphasized aggressive preservation strategies, yet due to the concentration of blight the area has lost multiple historic properties. Utilizing Louisiana State Historic Preservation Office 2011 historic building surveys this research will investigate the demolition of historic properties by comparing the historic building locations to 2013 WhoData on-the-ground surveys. The City of New Orleans Office of Place-Based Strategies, Office of Neighborhood Engagement and the Livable Claiborne Corridor Initiative have identified this neighborhood as important to expanding community development and affordable housing opportunities. There are resident concerns that with increased improvements to infrastructure, including the New Orleans street car expansion along community borders, and accessibility to HUD funding for housing development that the culture and traditions of Tremé will be destroyed. This study examines the process of bottom-up neighborhood planning, examines issues of citizen participation and reports on the efforts of applied PPGIS. 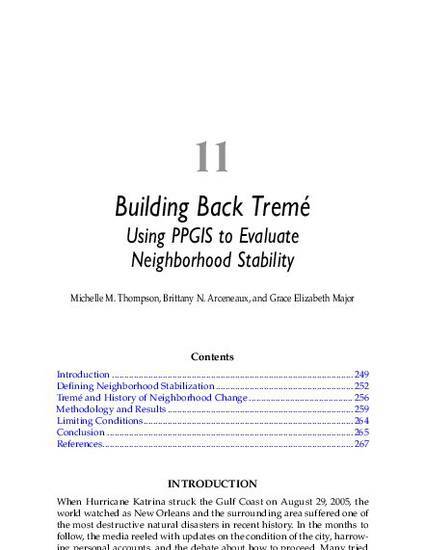 In these lessons learned, a more broad conversation about neighborhood planning post disaster can be provided to communities and policy makers where long-term decisions about planning for livable communities, sustainable markets while earnestly addressing issues of equity and justice are critical to a community that remains in recovery.